A proposed change to Central Manitoulin’s Restrictive Zoning By-law will be fatal for a small family farm. The Municipality of Central Manitoulin doesn’t like the use of sea containers within their territory, claiming it’s “in the public’s best interest to control the placement and use of sea containers”. 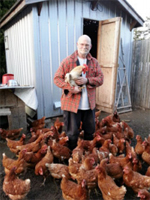 Glenn Black and his wife Judy specialize in producing safe, tasty, nutritious, locally produced foods such as pastured poultry, free range eggs, lamb, and goat from their 100 acre farm in Central Manitoulin. “If this draconian By-law against sea containers is passed, my farm is dead”, he said. Mr. Black explained that his family farm uses sea containers in an extensive way: to store animal feed and seeds, on-farm storage, as a brooder for their baby chicks, and for storing the fresh and frozen meats produced by the farm. “We customized a 40 ft. sea container to be a world-class brooder. Without that brooder, we can no longer raise pastured poultry. Without the income from our poultry operations, our farm cannot survive”, said Mr. Black. The proposed By-law specifically prohibits using a sea container to house animals. This is the fourth time that Central Manitoulin has proposed a By-law to ban sea containers. The previous 3 attempts to pass a sea container By-law were abandoned due to significant problems in the wording of the By-law, and public backlash. Alex Baran, the Central Manitoulin Councillor who initiated this latest attack against sea containers was asked to explain the Municipality’s hatred against sea containers, and how his proposed Bylaw is in “the public’s best interest”. Mr. Baran refused to comment. Mayor Richard Steven also refused to comment. SSEA Container Committee wants to: a) Build awareness of the issues; b) Provide options & opportunities; c) Foster community consensus; d) Avoid/prevent polarization of the community.